Expecting family this holiday season? Welcoming a caravan of relatives can be a chore or a joy, depending on your point of view. When relatives insist on bringing ‘Fluffy’, their eighty pound labradoodle, your to-do list just got longer. You love Aunt Jane, but you know the source of that yellow stain on your area rug originated from her beloved Fluffy last Easter. After all, he looked guilty when you pointed it out. Aunt Jane did not. 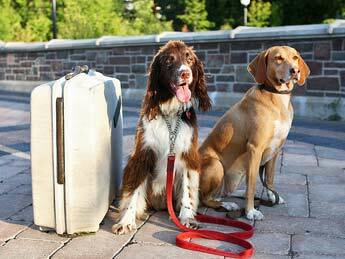 Make some preparations that will smooth out the ‘ruff’ spots when welcoming four-legged visitors. 1. Puppy-proof the guest room. Take up that area rug and replace it with a large bathmat. Place a folded blanket on top for extra luxury. Fluffy will be comfortable there and sends the message that the dog should not sleep on the bed. And, it’s all washable. 2. Provide a containment system. A gate or large crate to keeps Fluffy in the guest room if you all decide to go out to dinner or a movie. Leaving a dog loose in an unfamiliar house can set off separation anxiety, and he may chew your best couch pillows or scratch at the door in frustration. 3. Deliver some pet perks. Place dog bowls in the room, one brimming with fresh water, plus a chew bone and a treat or two. The dog’s owner will be touched and you’ll have a furry friend. 4. Give the dog ample exercise and places to relieve himself. A tired dog is a contented dog, but be prepared to grab the leash yourself if the dog’s owner is busy telling those same stories you heard last year. Heck, going on a walk with Fluffy gives you a chance to ditch all that togetherness for a few minutes and commune with nature. 5. Encourage good canine manners by leashing the dog indoors. This keeps him under the watchful eye of the handler and prevents exploring (and urine marking). 6. If your human visitor refuses to observe a few simple rules and thinks their dog’s rowdy behavior is ‘cute’, keep in mind the pet is not at fault. Take the owner aside and have a friendly chat. You may encounter a deaf ear, however, as advising pet parents can be like giving advice on child rearing: it may simply be ignored. This entry was posted in Uncategorized and tagged Christmas pet tips, dog care tips, dog gifts, holiday pet tips, pet gifts, travel with pets. Bookmark the permalink. I love this posting and it comes in the nick of time. We just hosted 3 dogs at our house for Thanksgiving and one of them was not very well behaved. This will really help out the next time our pup has her friends stay with us!